The story casts the player as lawyer Kate Walker, who, on behalf of the Universal Toy Company, travels to the French Alps to negotiate the take-over of an old luxury toy and automaton factory. Things could never be this simple though, could they? No. As it turns out, the owner of the factory has recently died and is being buried that very afternoon, having bequeathed ownership to her long-lost brother, Hans. It's here that Kate's adventure begins, as she sets out on her long journey eastwards in search of the elusive Hans, travelling through four distinct game worlds and being drawn ever more into the strange world of his creations - the creepy wind-up automaton toys. Syberia is fundamentally a game where the player finds an object and then places that object in a designated location to progress to later stages of the game. But as you progress, picking up, dropping and using items becomes much more complicated, and the mystery deepens even further. It s a game in which mystery and exploration take precedent a Sherlock Holmes clone, if you like. But it s enthralling, it captures the gamer s will to play on and it never lets go. Embarking on a desperate search for Hans Voralberg, Kate Walker crosses Europe from West to East, leaving her worldly possessions behind with the purpose of joining the heir of the Voralberg family on his journey. Together, through mystical and enchanting lands, they will hopefully find their way to a mythical Syberia, said to be the land of the forgotten mammoths. Though you mightn't be willing to trek hundreds of miles in the freezing cold in the real world, in the world of video games it's much more fun. Pointing and clicking your way through a vast range of beautifully rendered locales you'll most likely find yourself scanning Syberia II's backdrops endlessly in search of 'interactive spots' that will either reward you with clues or items that can be used later on in the game. It can be like looking for a needle in a haystack sometimes, but when you're not playing the role of intrepid explorer, odds are you'll be solving one of many fiendish Syberia puzzles. Far from easy, the mental tasks that await in Syberia II demand and a degree of logic and intelligence, making the adventure better suited to the adult gamer. 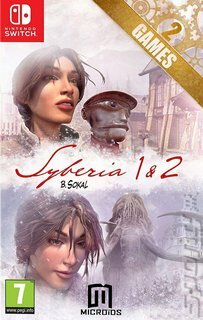 Syberia II is indeed taxing, but when the gameplay elements are blended into a stunning game world with a captivating plot, it all becomes worthwhile.